On the 14th, we proceeded in the direction of Jackson, the Seventh Division having the advance, and marched without interruption until within about 3 miles of Jackson, when we encountered the enemy in strong position, his batteries posted so as to command the road and his infantry covered by woods and ravines. The division was at once deployed, the Second Brigade, commanded by Colonel Holmes) occupying the right and left of the road; the First Brigade, commanded by Colonel Sanborn, on the right and rear of the Second Brigade; and the Third Brigade, under Colonel Boomer, to the left and rear of the Second Brigade, this brigade in the woods. The line being thus formed, was ordered to advance, which it did, followed by the Sixth Wisconsin Battery, Captain Dillon commanding. The advance was made in the most gallant and satisfactory manner. Not a man wavered or faltered, but proceeded, under the most galling fire, to drive the enemy at the point of the bayonet from his strong position. The battery advancing with the line of infantry, took position, and, when the enemy broke and retreated, poured into the fugitives an effective and destructive fire. The enemy having abandoned his position, it was supposed that he would make a stand in his works before Jackson, but our skirmishers and line steadily advanced into their works and into the town without further resistance, taking possession of the works and seven guns, which the enemy in his haste had neither injured nor attempted to carry away. Captain [Cornelius] Cadle, of my staff, and Captain Martin, acting assistant adjutant-general of the First Brigade, planted the flag of the Fifty-ninth Indiana on the dome of the capitol of the State of Mississippi. On the morning of the 15th, we retraced our steps in the direction of Clinton, General Logan's division taking the lead. 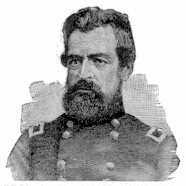 From Clinton we proceeded [on the 16th] directly toward Vicksburg, the division of General Logan still having the lead. Near Edwards Depot we came up with the division of General Hovey, of Major-General McClernand's command, who, having the advance, encountered the enemy, posted with great care and in strong force across Baker's Creek, on what is called Champion's Hill. The two divisions, Generals Hovey's and Logan's, were at once formed, General Logan's on the right and General Hovey's on the left, and attacked the enemy with great fury, driving him on both flanks. In the mean time two brigades of the Seventh Division coming up, it soon became apparent that the enemy in front of General Hovey was being re-enforced, and that he was hard pressed. The Third Brigade, Colonel Boomer, was, therefore, ordered to proceed to his support, which he did in the most gallant style, ascending a hill, entering a wood, and taking position in front of an enemy of three times his force. The First Brigade, under Colonel Sanborn, moved to the right to support the batteries planted in the field. It soon became apparent that the critical point was our left. As General Stevenson had been entirely successful in driving their left, the enemy seemed determined to effect the same with ours; two of the regiments of Colonel Sanborn's brigade were, therefore, ordered to the support of Colonel Boomer. Colonel Boomer, by the most desperate fighting, and with wonderful courage and obstinacy, held his position in spite of the continued and furious assaults of the enraged and baffled enemy; but it was apparent that he sorely needed assistance, and, unless speedily assisted, his position was in danger. At this critical moment Colonel Holmes arrived in the field with two regiments of the Second Brigade, the Seventeenth Iowa and Tenth Missouri, and, being informed of the position of affairs, proceeded with the greatest alacrity and enthusiasm to the front, relieving Colonel Boomer, who by this time was entirely out of ammunition, and charged the enemy with a shout, who broke and fled in the greatest confusion, leaving in our possession the regimental flag of the Thirty-first Alabama, taken by the Seventeenth Iowa, and two guns of his battery. This ended the fight. Our right, under General Logan, had already driven them, and when they broke on the left the rout was complete. That night we encamped near the battle-field. On the morning of the 17th, Brigadier-General Quinby having returned, I was relieved of the temporary command of the division. Of the conduct of the officers and men of the division I cannot speak too highly; their charge at Jackson, seldom if ever excelled in any campaign, has been the theme of universal praise the stubbornness and courage with which they fought at Jackson and Champion's Hill have won for them the admiration of the army. To the staff of General Quinby I return my especial thanks for the zeal, industry, and fidelity with which they discharged their difficult duties during the march and on the battlefield. I am also under obligations to Captain Cadle for the fidelity with which he discharged his duties. Several brave, reliable, and valuable officers of the command were killed in the different engagements, whose names and services are mentioned in the reports accompanying. For full details of achievements of the respective brigades and regiments reference is respectfully made to the reports of brigade and regimental commanders forwarded herewith.